Valuable, skilled and personal in everything we do. We are award-winning specialists in voice communications, systems integration and managed services,maximising the ICT investment of private and public organisations across the UK. Most importantly, though, we are your partner when it comes to designing, delivering and developing your business communications. We closely work with you to understand your business goals, processes and culture. Then we build and support your integrated solution with network services, systems and applications that really meet your end user needs and commercial requirements. Scalable telecoms and knowledge share for housing. We work hand in hand with Procurement for Housing members and leading technology partners such as Mitel, Microsoft, Avaya, Capita and Orchard Systems to review, design, deliver, maintain and develop your unified communications platform. For you, that means more efficient back-office operations and improved digital customer service, so you can serve your tenants and community well. Britannic achieves G Cloud 10 supplier status. Public sector customers are able to purchase cloud-based IT services from Britannic through the G-Cloud 10 Framework. Buying services through frameworks is faster and cheaper than entering into individual procurement contracts. These services can be bought through the digital marketplace. Educational establishments can save time and money. Britannic is an approved supplier of Telephony Purchasing Services on the Jisc framework, providing cost-effective communications solutions for the UK education and research sectors. We are award-winning specialists and we are serious about great outcomes. Discover companies like yours that have transformed their business with Britannic. 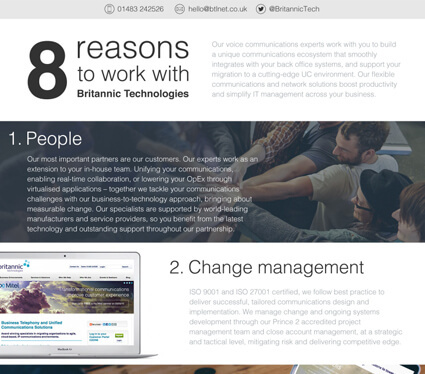 The Britannic team is a diverse and dedicated group of communications technology experts. We are passionate about our customers' business success, digital transformation and future-proof solutions. Our consultants focus on empowering Senior Technology and Business Executives to align communications technology with business outcomes. Our technical specialists design, deploy, integrate and maintain the communications solution that’s right for your business. We'd love to hear from you! Find your next opportunity on our careers page. Our close-knit partner ecosystem means two things: Strong support for your systems, applications and networks and reliable innovation that embraces your existing technology investments. We have long-standing strategic partnerships with leading communications vendors, software developers and Tier 1 carriers. Not only does that give us a portfolio of best-in-class solutions to pick and mix from, it gives our teams access to continuous technical training, additional support for your systems and deep technology expertise either to enhance your existing environment or to design future-proof solutions that meet your desired business outcomes. We regularly co-host seminars, workshops and meetings with our partners so you, too, can pick their brains on the latest CTI market and technology developments.